I can still recall my very first student back in 1992, who taught me about the power of trauma and how it lodges itself in the body. In her case, the trauma was a result of a car accident in which she used her hands to brace from the impact. Every time she was prone with her hands out, she would excessively brace her hands and forearms when she felt afraid. Instinctively, I found my way around the tension and, over time, was able to tease it out of her nervous system. From working with countless adults who have had horrible experiences around water, including near death, I have learned how to release the tension without triggering someone. I do this by taking the time to closely read a person’s facial expressions and body language, as well as provide an energetic container of safety and compassion. My capacity to authentically meet people where they are is invaluable in these situations because of my own history with trauma. Over the years, I have done significant research to expand my understanding of the effects of trauma. The number of adults who don’t know how to swim is staggering. An estimated 37% of U.S. adults can’t swim 25 yards, the length of a typical recreational center pool (Centers for Disease Control and Prevention). In my opinion, someone who can swim only one length of the pool does not qualify as a swimmer. Case in point: according to the CDC, “swimmers” comprise more than 70% of drowning deaths in the U.S. each year. I define a swimmer as someone who is comfortable swimming for 500 yards – without breaks. My fear of water is almost obliterated. I was snorkeling yesterday and my body was relaxed and my breathing very controlled. THANK YOU THANK YOU THANK YOU. On the way back to shore, about 12 dolphins started to play in the wake of the boat and you could almost touch them. It was such an amazing water experience. You have given me such a gift. I used to “fear” each birthday as I get older. I only now want to get stronger, faster, and look forward to new experiences. When I was about five years old, I fell out of a boat in the middle of Broadmoor Lake near Colorado Springs. Since then I have had a continuing fear of water. Beth Davis has helped me to ease that fear, to begin to trust myself in the water. How has she accomplished this turnaround? First of all, through amazing patience and understanding. Beth has never given up on me! She has zillions of exercises for me to try in the water; if one is too hard, she comes up with another that’s easier. 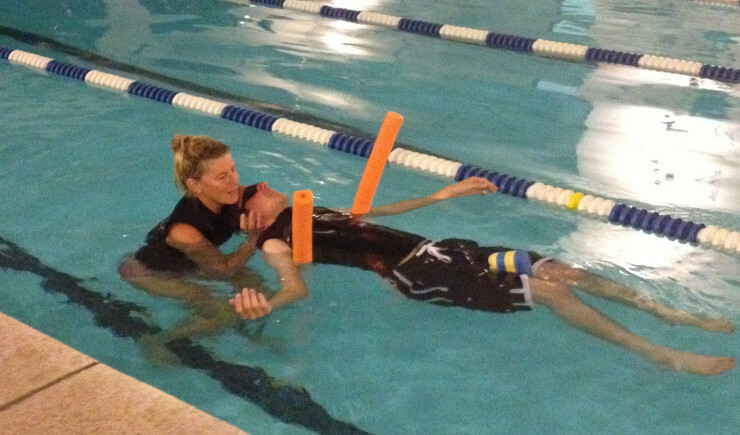 I have taken swimming lessons from Beth off and on for seven years. I can actually swim freestyle now, do an elementary backstroke, and a beginning breaststroke. More important, I feel comfortable in a swimming pool. I still have a ways to go, but I started at zero, not wanting to even step in the water, much less get my face wet! Beth is a topnotch swimming instructor. She is knowledgeable, dedicated, and kind.